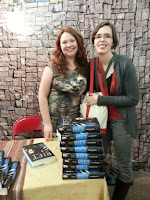 As you guys know, I have been to a lot of Andrea Cremer signings because she used to live in the Twin Cities area. She recently moved to NYC, but in August Rift, which is the first book in the Nightshade Prequel series, was released. Andrea went on a small tour for Rift and thankfully Red Balloon Books was once again one of the stops. I haven't had the chance to read Rift yet (after all, I only read Bloodrose in August and have yet to review it here) but I was able to attend the signing and pick up a copy. The event started at 6 so I got there a little early. I actually browsed in some nearby shops beforehand and found some great accessories on sale, so I was pretty happy with myself. I also had the opportunity to look around the store, buy copies of Rift, and pick up The Very Busy Spider by Eric Carle, which I like to use during storytimes. Andrea Cremer came out at 6 wearing an amazing wolf-printed dress from Modcloth. After talking some about her writing process from Rift, she did a short reading. I'm really looking forward to the book after hearing the passage she read. Plus, it helps that everyone has said that this book is even better than the Nightshade trilogy. Andrea wrapped up by answering questions. I know she's a big fantasy lover, so I asked what fantasy has had a big effect on her as a writer on person. I can't remember everything she listed, but I remember that she mentioned The Mists of Avalon by Marion Zimmer Bradley and A Game of Thrones by George R.R. Martin, as well as Doctor Who. She also mentioned that she was working on The Inventor's Secret and talked a little bit about Rise and Invisibility release in 2013. I'm so excited for all three books! After that, she signed books! I was able to get a signed copy for myself and pick up one for you guys. Check out the rules and fill out the form below if you're interested. *One winner will receive a signed, finished copy of Rift by Andrea Cremer. *The giveaway will end on Nov. 12th at 11:59 p.m. CST. Rift is amazing! I like it much more than the Nightshade trilogy, and I thought those were good. Thank you for the chance to win a signed copy! Thanks for the giveaway! I love the Nightshade series! Thanks for this chance to win. I am new to this author and the series, but am looking forward to reading them at some point in the near future! I'm really looking forward to reading this one! I loved the Nightshade series! ;) thanks for the chance! Game of Thrones is AWESOME!! Is one of my favorite books! I really enjoyed Nightshade and can't wait to read this one.